So, I went to the forest yesterday, to look for some firs to do more decorating around the house. 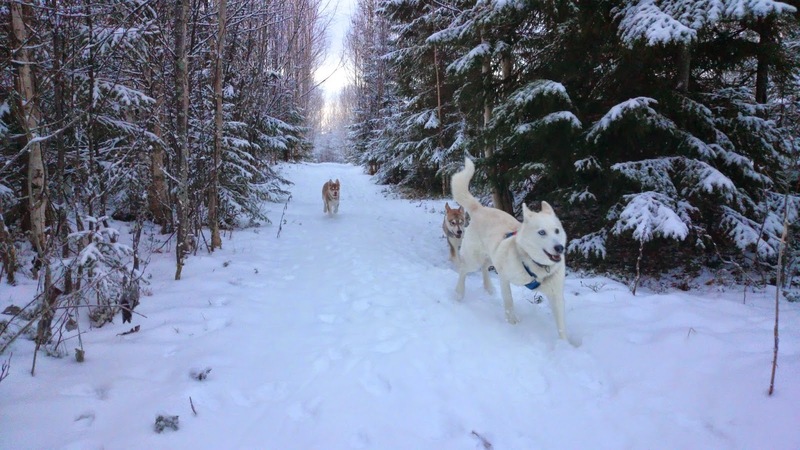 We went for an awesome walk with autntie Mouse, mama dog Krtek and the puppies yesterday. It snowed the last couple of days so everything looks so wonderful and Christmasy and wintery, even with the lack of snow, this is so much better than nothing. 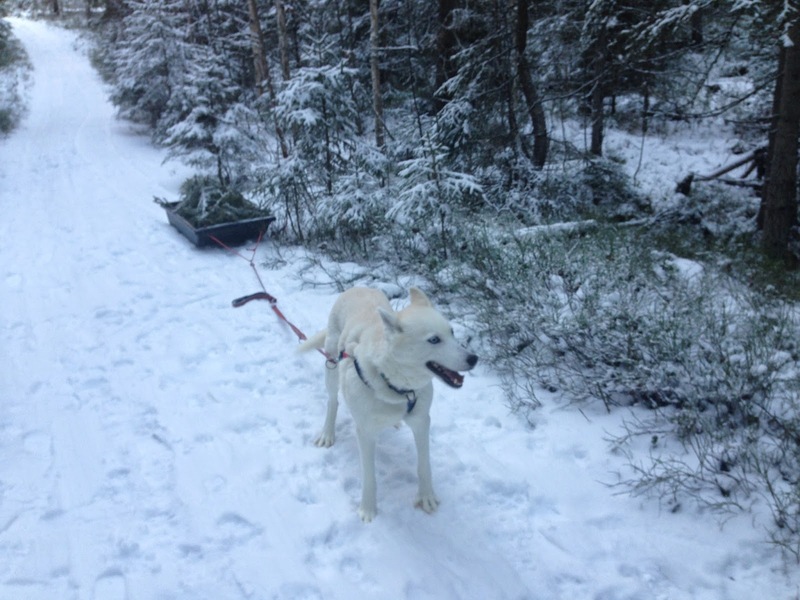 Plus it hasn´t been more than ten below lately and that is always a good thing for us here up north and for the Huskies! 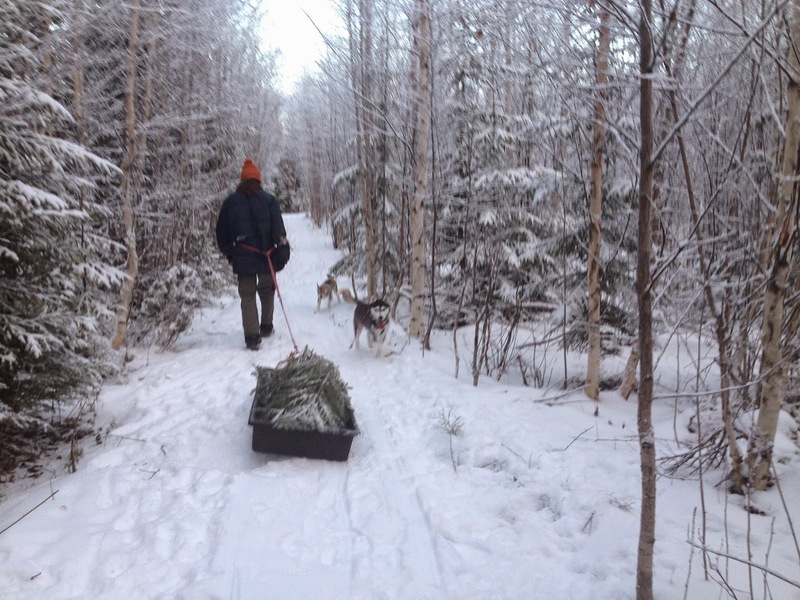 We cut some nice, wonderfully smelling spruce and juniper boughs and I picked a few blueberry and cranberry stems as well, while the dogs had a blast chasing each other up and down the trail and through the woods. 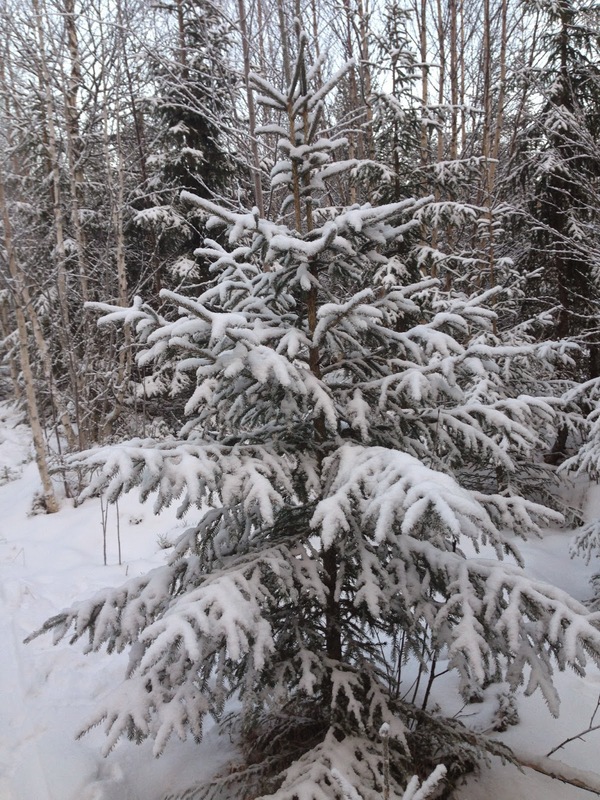 Seriously, is there anything prettier than an evergreen tree decorated with fresh fallen snow and frost? If you are guessing that we took this guy home with us, you will be wrong! We could never kill a tree for its couple weeks of bitter-sweet glory. 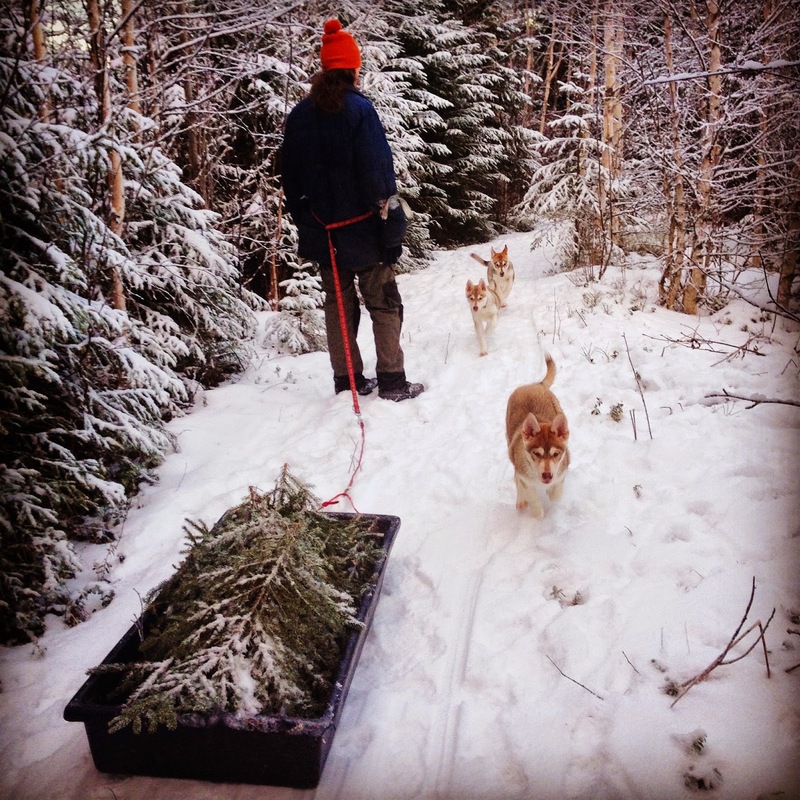 From time to time (which is actually quite often) we end up with a real Christmas tree, which has fallen victim to the insensitive mass destruction of forests around here during logging, or one that fell in a storm or in the worst scenario, had to be removed during trail clearing. Call us nuts, but we believe that plants are living creatures too and deserve some respect. 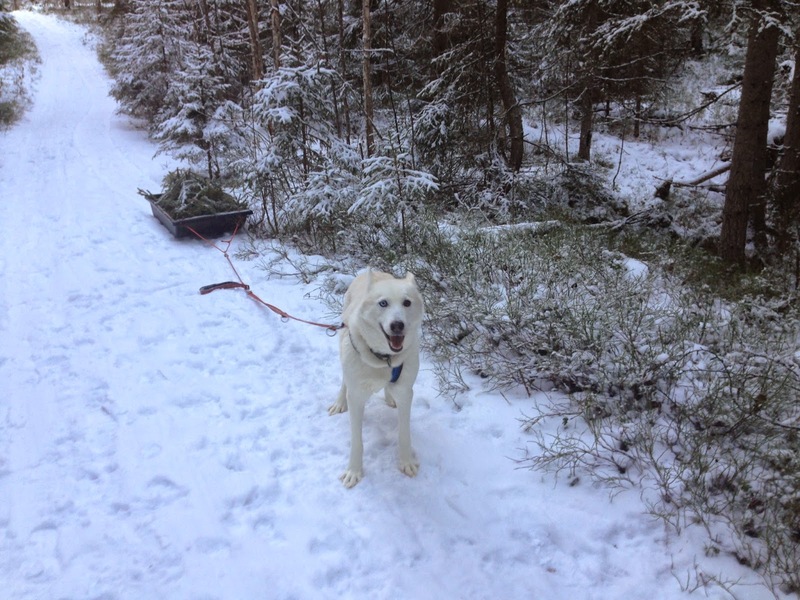 Anyhow, we took some moments to enjoy the beauty of the snowy forest before we headed back home. Hope you all are enjoying your Christmas preparations thoroughly, and if you don´t celebrate this holiday, that you are enjoying the winter time and the last days of this year. Take care, keep safe, keep warm!